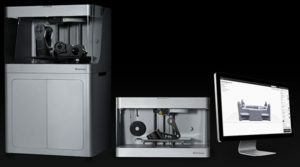 Adaptive is the first PLM software reseller of Markforged 3D printers. These are the only 3D printers that embed continuous fiber into printed carbon and nylon for an end-use composite part with the strength of metal. These affordable 3D printers are right for various applications where strong durable parts are needed, and are suitable for functional testing and end-user parts. In addition to the desktop printer, we also offer an industrial 3D printer, the Mark X, which increases the print size and includes in-process inspection and additional precision features. And the Metal X – The World’s First Atomic Diffusion Additive Manufacturing (ADAM) Machine. Looking to create mold, tooling and die parts in-house? Contact us and we can show you how simple and affordable having your own 3D printing solution can be. And, not just any 3D printer. With its carbon and nylon printing capabilities, it meets your needs for durability for prototyping and preproduction standards. Create strong, production-ready parts right off the printer and get products to market faster with 3D printing capabilities. Parts printed on a Markforged 3D printer are up to 30x stronger and stiffer than those same parts made on other 3D printers. Request a free sample part and see for yourself. The world’s only 3D printing systems capable of automatically reinforcing engineering plastics to aluminum levels of performance and beyond. Nylon White – an Engineering Thermoplastic that is non-abrasive and can be painted. See the specs – click here.